July 26, 2012 - After covering about 6000 km during its first intercontinental roundtrip journey between Europe and Africa, the experimental solar airplane of Bertrand Piccard and André Borschberg landed in Payerne, Switzerland at 08:30 PM on July 24, 2012. 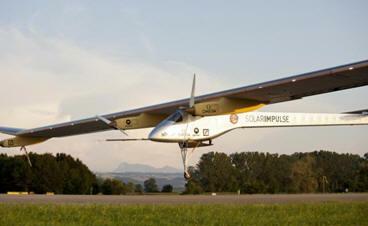 Piloted by Bertrand Piccard this final flight between Madrid and Payerne, with a stopover in Toulouse, concluded the world's first roundtrip solar-powered intercontinental flight. This journey to Morocco, which started on May 24, 2012, consisted of eight flights totaling about 6000km and 13 hours and 29 minutes. With Bertrand Piccard and André Borschberg taking turns in the single-seater cockpit, it brought Solar Impulse to Madrid, Rabat, Ouarzazate, Toulouse and back to Payerne. The most challenging destination not only for this aircraft but for commercial ones as well was Ouarzazate, Morocco, a region rich in turbulence and strong winds. This year’s Crossing Frontiers mission flights have further proven the reliability of the aircraft’s technology and the efficiency of its energy consumption. Often landing after midnight to avoid thermals, it was almost always brought back to the hangar with a full set of batteries. Originally built only to prove the possibility of flying day and night (26 hour flight completed in 2010), the HB-SIA prototype is now in the process of collecting a number of distance world records for solar aircrafts, documented and being verified by the International Air Sports Federation (FAI), in straight distance, free distance and distance along a course. “It’s been an extraordinary adventure not only for what we’ve achieved with this airplane, originally only designed to demonstrate the possibility of flying day and night with a purely solar energy, but also for what has resulted in a tightly fused team, confident in the project and in their capacity to make it happen.” said André Borschberg, CEO and Cofounder of Solar Impulse. Bertrand Piccard, Initiator and Chairman of the Solar Impulse Program, said as the ground crew opened the canopy. “The success of this mission was not only aeronautical: it also stands in the quantity of positive emotions we managed to bring to the cause of renewable energies.” This intercontinental flight campaign, under High Patronage of His Highness The King Mohammed VI and upon invitation of the Moroccan Agency for Solar Energy (Masen), allowed Solar Impulse together with Masen to raise awareness about solar energy’s potential and about Morocco’s pioneering solar plan whose goal is to build the world’s largest thermosolar plant in the region of Ouarzazate. This month of events in Morocco underlined Solar Impulse’s and Masen’s common message to invest in innovative projects today for job creation and sustainable growth while also decreasing dependency on fossil fuels. “This Moroccan mission was a success from all angles as well as an extraordinary human experience. Apart from the interactions with the extremely qualified and multidisciplinary Solar Impulse team, this event was an occasion to share our convictions, our values and our engagement with national and international communities thanks to the mobilization of thousands of people during the events we organized on the runways of Rabat-Salé and Ouarzazate and thanks to the millions of viewers through the media.” said Mustafa Bakkoury, President of Masen. Solar Impulse HB-SIA, the first airplane designed to fly day and night without requiring fuel and without producing carbon emissions, demonstrates the enormous potential held by new technologies in terms of energy savings and renewable energy production. Seven years of intensive work, calculations and tests by a team of 70 people and 80 partners have contributed to producing this revolutionary carbon fiber airplane, with a wingspan as wide as that of an Airbus A340 (63.4m) and a weight equivalent to that of an average family car. It is the largest airplane of its weight ever to have been built. The 12,000 solar cells integrated into the wing supply four electric motors (maximum power 10CV each) with renewable energy and charge the 400kg lithium polymer batteries during the day, enabling the aircraft to fly at night. The Solar Impulse project is supported, among others, by: Solvay, Omega, Deutsche Bank and Schindler as Principal Partners; Bayer Material Science and Altran as Official Partners; EPFL (Lausanne Federal Institute of Technology) as Official Scientific Consultant and Dassault-Aviation as Aviation Consultant.